The two Ponti villas are accessible to the left of Villa Litta Panza, where the gate opens providing access to the public garden they are located in. The exclusive residence of Villa Ponti, which was built in 1858 in Neo-Renaissance Venetian style by architect Giuseppe Balzaretti, was commissioned by textile industrialist Andrea Ponti. He was born in Gallarate in 1821 and along with his brother, ran the company that later became "Antonio & Andrea Ponti". Two personalities in this family were destined over time to become among the most representative in the economic and social context of Lombard entrepreneurship at the time: Andrea and his son Ettore. The work site at the villa made slow progress and the initial design was never completely finished perhaps due to the owner who believed the addition of the two side wings was detrimental to the monumental appearance of the central body. 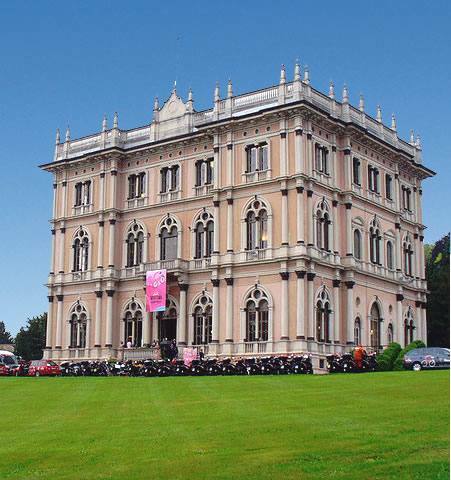 In 1961, the villa was transferred from Marquis Gian Felice to the Chamber of Commerce of Varese which, while leaving intact the precious art heritage it was home to, used it, together with adjacent Napoleonic Villa, as a Convention Centre. The search for monumental extolling that is characteristic of the exterior architecture, is also found inside, arranged around the large orthogonal atrium constituting an elegant hallway for the spacious halls embellished with sophisticated stuccoes. The Hall of Honour in the villa is decorated with historic paintings by Giuseppe Bertini, the most famous one being on the east wall and depicting Alessandro Volta explaining how a battery works to Napoleon. 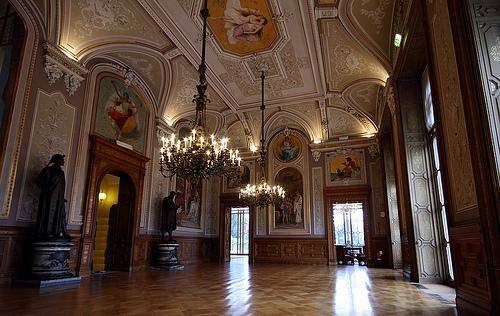 There are also two bronze statues in the hall depicting Dante and Michelangelo, by Bertini and Tabacchi respectively. 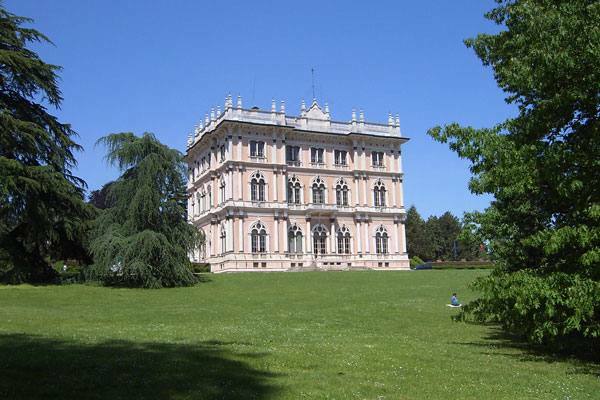 Villa Fabio Ponti or "Napoleonic Villa"
The villa’s English park, which is embellished with a little lake with spring water, is home to luxuriant vegetation including yews, maple trees, cypresses, cedars and fragrant magnolias. In the shade of the luxuriant park, behind Villa Andrea Ponti, is the almost homonymous neo-classical villa, which gets its name from Fabio Ponti, however it is called the Napoleonic Villa. It was probably built in the 17th century on a project by Pollack. It was expanded and embellished between 1820-1830 and 8 years later was purchased by the Ponti family as a summer residence. In the following years, the family created a connection between the parks and two villas. 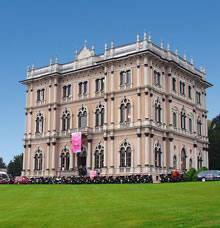 The Napoleonic Villa is well-known because Garibaldi directed the clash against the Austrians from here 26 May 1859.